If I had the choice between meat, chicken, fish or seafood/shellfish as one “animal” type ingredient to eat for the rest of my life, I would with no doubt choose seafood/shellfish. 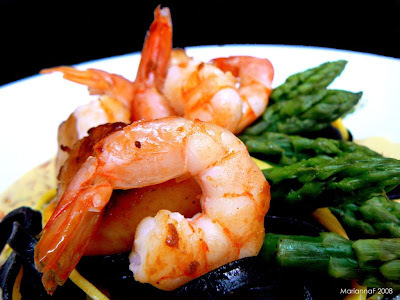 I love it just as much as I love chocolate, so I simply cannot imagine a life without seafood & shellfish, like for example… scallops and shrimps which are actually part of what my post is about today. These kind of ingredients are especially popular during the holiday season here in France (along with foie gras of course, but I’ve never been a fan of foie gras believe it or not). This dish is a result of one of my nth spontaneous experimentations, and I realized that for the next time, I will need to twitch some details in terms of the presentation, because the recipe in itself turned out to be very tasty. 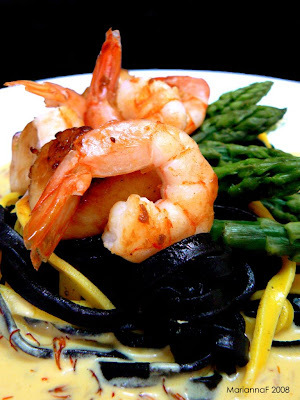 For the eyes, it was a feast being a colourful dish with bursts of green (asparagus), yellow (saffron pasta), black (squid ink pasta) and rosy tones (shrimps & scallops) which all complemented each other to produce a rather elegant taste for the tastebuds. 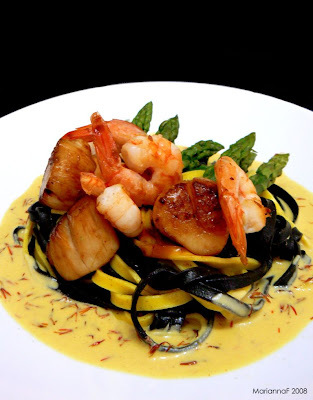 I find saffron and seafood to always match up well, it is one of those classics that always work out and which is also very present here with a delicious sauce made of amazingly fragrant kaffir lime, white wine, some cream, and saffron. 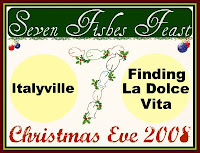 I’m also submitting this to the Seven Fishes Feast event hosted by Maryann of Finding La Dolce Vita and Joe of Italyville. Please note that when I cook savory, I tend to eyeball quantities. Sorry for the lack of precision, if you have any specific questions though I’d be happy to help- drop me a comment! 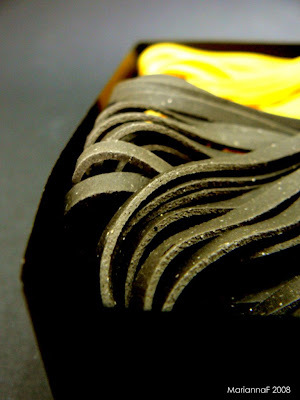 Saffron and/or Inksquid pasta- if you can get both, that would be great! As with all savory dishes, the mise en place and serving temperature is crucial. Chop the shallots and set aside. Start off by cooking the pasta. During this time, chop off the rough ends of the asparagus, and boil for about 6 mins. 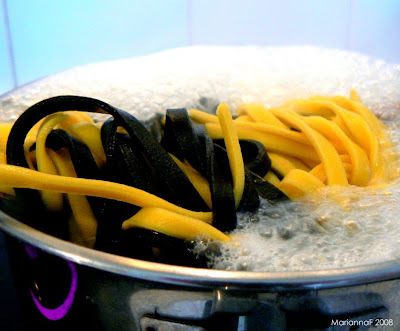 When pasta is ready, remove and run under cold water to stop cooking process. Set cooked asparagus & pasta aside. Now the sauce: place the shallots in a pot with a bit of olive oil until they turn into a translucent golden colour. Add the white wine, kaffir lime & zest and let simmer for 2-3 mins. With a strainer, transfer mixture to another pot as you want to remove the shallots & zest (I removed the shallots for aesthetic reasons and to keep a silky smooth overall texture). Now, in the “new” pot add the liquid cream, saffron and season with salt- turn down heat and let the flavours infuse. Lastly, pan-sear the scallops & shrimps by placing them in a hot pan covered with some olive oil. Season with S&P according to personal taste. If you can, at the same time, heat the pasta & asparagus (separately) in deep pans with a few drops of olive oil. Season with salt according to personal taste. Place ingredients on serving dishes, and at the very end, heat the sauce and whisk (takes about 1 min in total) to accompany the dish. With this order, everything should be at the correct temperature so you can enjoy the flavours at their best! 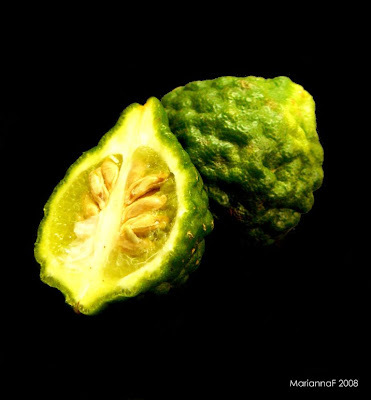 *Kaffir limes can be bought at Asian food speciality stores. They have a wonderful peculiar taste & scent of limes and coriander. 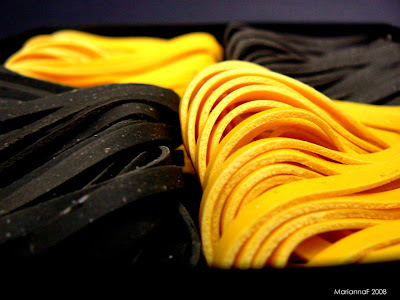 The fresh pasta is gorgeous and yes, saffron pairs well with seafood. I think the pics turned out good and now doubt delish in the bath of saffron. Oh Lord...that's all I can say - this looks great!